The iSDG model (MI 2016) was constructed starting from the well-vetted, time tested and validated Threshold21 (T21) model that has evolved over the past 30 years through research and application by the Millennium Institute (Barney 2002). The iSDG model is a System Dynamics based model for comprehensive and participatory development planning. The model integrates economic, social, and environmental factors, and represents the important elements of complexity – feedback relationships, non-linearity and time delays – that are fundamental for effectively addressing development issues. The model can be customized to country-specific conditions, and simulates the medium- and long-term consequences of alternative policies. Hence, it allows for easy comparison to reference scenarios, so to serve as a participatory tool in consensus building and policy discussions (Pedercini 2005; Pedercini and Barney 2010; UNEP 2014). The figure provides a conceptual overview of the iSDG model structure, which includes 30 interacting sectors. 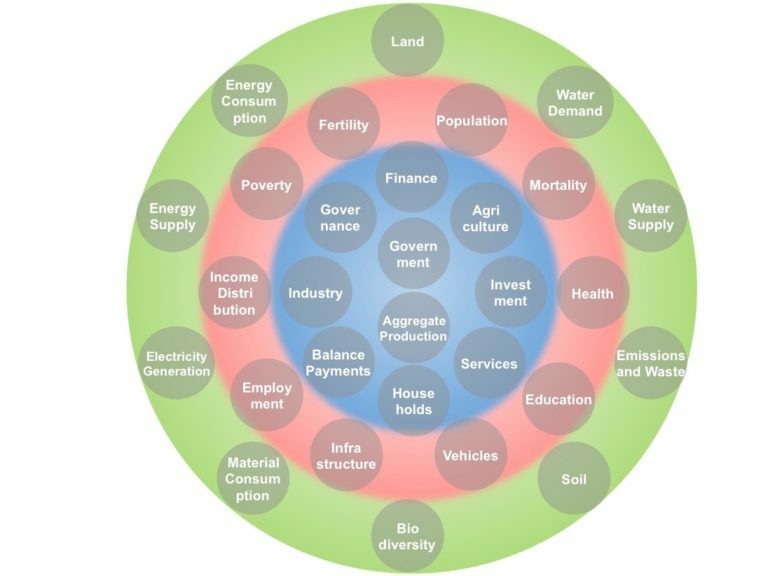 Economic activities (blue circle) take place within society (red circle), from which social resources are drawn to generate economic value, and within the broader natural environment (green circle), which contributes sources and sinks of natural resources, emissions, and waste. All sectors interact dynamically; a change in one sector leads to impacts over time on all other sectors. This feedback-rich structure endogenously determines the behavior of the model, as economic, social, and environmental indicators respond to the accumulation or decay of resources over time. Millennium Institute (2016): “Threshold 21 (T21) iSDG Model documentation” (Washington D.C.: Millennium Institute), https://www.millennium-institute.org/documentation (accessed on 29 October 2018). Barney, G. O. (2002): “The Global 2000 Report to the President and the Threshold 21 model: influences of Dana Meadows and system dynamics”, System Dynamics Review, 18(2), pp. 123-136. Pedercini, M. and G.O. Barney (2010): “Dynamic analysis of interventions designed to achieve Millennium Development Goals (MDG): The Case of Ghana”, Socio-Economic Planning Sciences, 44, pp. 89–99. Pedercini, M. (2005): “Potential Contributions of Existing Computer-Based Models to Comparative Assessment of Development Options” (Washington D.C.: Conservation International). United Nations Environment Programme (2014): “Using Models for Green Economy Policymaking”. Nairobi: UNEP.